Discussion in 'Grappling Technique' started by LeatherWhip, May 20, 2008.
supplement their teaching for their students by posting their own video library of techniques and methodologies? For example, maybe one class was just spent teaching and practicing the side mount escape, and at the end, the teacher may say "Guys, I think that if you watch the clips on side mount escape in the school library, it should bring these points home to u"
Is it even a good idea? I tend to think that for the teacher, it may help to establish the school brand, while also emphasizing what has been taught. It's a great idea, and some schools do it for sure. Phil Migliarese, head of Balance Studios, has his 'jiu jitsu matrix' vids, and the affiliate in Delaware has started up the Takedowns 101 website, which also has tons of free vids. I don't do it in the beginning because there is a lot of crap out there that younger students can get there hands on. I think when you are more advanced student you have the understandings necessary to realize what is good and what is not. I am a big fan of video as a supplement to training. If I had my way, every practice would be video taped. Both the instructor's lessons and my attempts at them. Sometimes you miss a key element because of where you are standing or you don't realize you are doing something wrong. Video will point that out to you. I also like the idea of video taping yourself in competition and dissecting it afterwards. Another thing I like, with the rise of the internet, is the ability to tape yourself and post it online for feedback. You can email people you know are skilled for their opinions, or post it in forums like this one. One of the things I don't like about the popularity of MMA is that your average BJJ or MMA school is probably pretty packed. You basically have to hope the instructor notices you to get some feedback. It is more likely that you will have to notice you are doing something wrong and then ask for help to correct it. I watch the MT class before I do BJJ and there is one guy I have been watching for about 2 weeks now who is making so many errors while working the pads that it is painful watch. No body has noticed yet because it is just so packed (luckily the BJJ class is a little smaller and with more assistants). Video will help you pick up on these errors and get the correction you need. I am trying to pick up a digital video camera (been outbid like 7 times stupid ebay) so I can at least video tape my competitions and hopefully I can convince Adam to let me video practices. Jean Jacques Machado has a database on his website which has something like 700 video clips of him demonstrating various techniques. You have to pay a monthly fee to access it, but its well worth it in my opinion . There's a fair few of them around now. That ranges from the much maligned Submissions 101 (though the guy who runs that recently got his purple belt under Eddie Bravo) to more widely respected collections like the one produced by Rowan Cunningham (also on Google Video). Sounds like a good idea to me, and if I ever found myself with the skill to run a school, I'd love to do it. Videos are excellent as supplemental material to techniques you've already learned in class. I think Roy Harris has video's as well. Not sure if you have to sign up for them or not though? I think it video is a great idea if it is used as a supplement and not a replacement. However there is also a lot of garbage video instruction out there (but there are some gems worth searching for!). I know a few instructors who post online for their students to re-enforce what they teach in class. This way they have control over what they want their students to watch and pay attention to. I think it is a added bonus to any syllabus as long as it emphasizes the spirit and technique of the art. Our gym is going to start to implement this soon. 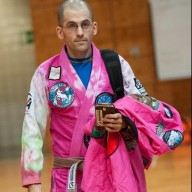 My instructor Phil Migliarese has a lot of videos on youtube and jiujitsushare.com he also runs the jiujitsumatrix.com which puts out new techniques every week. It's definitely a good resource to have access too. If you put up videos, students may miss class more and decide 'oh I'll just watch the video and catch up next class' or something along those lines. Maybe even people that aren't even gym members get a free ride out of it (unless you have a protected site). It's not good to promote that, but I LOVE what BJ Penn did and posted up some classes he taught on his website a while back. I wonder if students would pay for the additional supplement... in that instance, it might be worth it for both the instructor and student. If your instructor has the access and ability to produce high quality instructional videos as a learning supplement, by all means have him do so. By explaining techniques clearly, with different angles, it allows a student to absorb the information at their own pace, pausing and rewinding when needed. However, this should strongly be suggested as a supplement and not the direct source of learning technique. It's just like swimming - you can be told about it, read about it, view videos about it, however you can only learn by jumping in the water. Submissions101.com has a number of videos too. Some based on Eddie Bravo's 10th planet system. Video is a good way to check things out, but I've found that I need at least on person to roll with while watching videos, so that I can immediately build muscle memory for the moves.